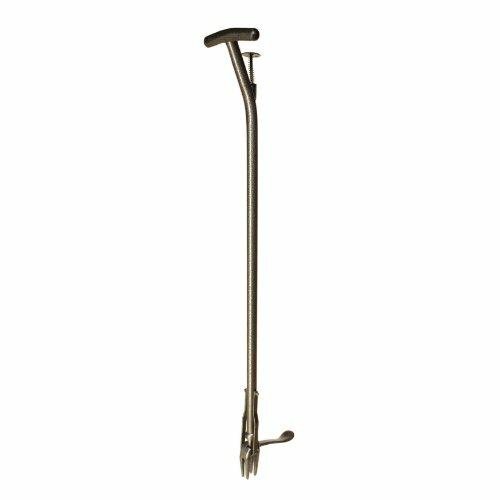 Lewis Lifetime Tools RKT-1000 Rocket WeederLewis Lifetime Tools RKT-1000 Rocket Weeder Features: The Rocket Weeder's rocking action is great for removing the toughest weeds, roots and all Features an ergonomic handle and easy ejector 37" 5" x 10"
ENVIRONMENTALLY FRIENDLY. Removes even the toughest, biggest dandelions, thistles, and weeds by the roots without chemical weed killers. ERGONOMIC DESIGN FOR LEVERAGE AND COMFORT. The long ergonomic handle maximizes leverage and is easy on your back. No kneeling or bending. EASY TO USE AND QUICKLY WEED YOUR WHOLE YARD. The standing Rocket Weeder's foot pedal provides even more leverage to grab the whole root and just rock it out of the ground. Then the weed ejector button keeps your hands clean for disposal. BUILT TO LAST. Powder coated durable steel construction, 37 inches tall, 7 inches wide, and weighs 4 lbs.